Some Russian experts warn that the fate of ceasefire in Eastern Ukraine hangs on the problem of the "Debaltsevo pocket", where thousands of Ukrainian troops are encircled by rebel forces. The ceasefire in the Donbass region of eastern Ukraine is now in its third day, but both sides are reporting further shelling by their opponents. According to the OSCE, the ceasefire, signed by the leaders of Russia, Germany, France and Ukraine at a meeting in Minsk on Feb. 12,is being observed in general, but the situation around Debaltsevo remains complex. The truce came into force on Feb. 15. Will the ceasefire in eastern Ukraine work this time? The situation remains tense around this town on the border of the Donetsk and Lugansk regions that has been encircled by rebel forces. OSCE observers have stated that they failed to enter Debaltsevo on Sunday, Feb. 15, because they were not allowed into the area by the rebels. Ertugrul Apakan, chief monitor of the OSCE Special Monitoring Mission, has called on both sides in this regard to provide access for observers to all parts of eastern Ukraine. According to the Minsk agreement, the OSCE should ensure "effective monitoring and verification of the ceasefire regime and the withdrawal of heavy weapons." The withdrawal was set to start on the second day of the ceasefire. According to Russian military experts, the ceasefire in Donbass is being observed on the whole, but shelling is continuing in the area of Debaltsevo and the coastal city of Mariupol. The analysts speak positively about the role of the OSCE and its estimates, placing some hope in the organization concerning its support for the implementation of the truce. According to Konstantin Sivkov, first vice-president of the Academy of Geopolitical Issues in Moscow, the OSCE provides a rather objective picture of what is happening in the Donbass, as the key European players – Germany and France – are not willing to allow the Ukrainian conflict to expand. "The OSCE documents the violations [of the ceasefire], and political decisions are then made in Berlin and Paris," Sivkov told RIR. The head of the Center of Military Forecasting, Anatoly Tsyganok, also notes the positive role of the OSCE in the context of the current crisis. "The OSCE is rather skilful at predicting the situation and making its reports. The role of the organization has grown significantly over the past six months," he said in comments to RIR, attributing this to a shortage of other tools for resolving the crisis in eastern Ukraine. According to Tsyganok, a representative of the organization played a positive role in persuading the rebels to sign the agreement in Minsk. 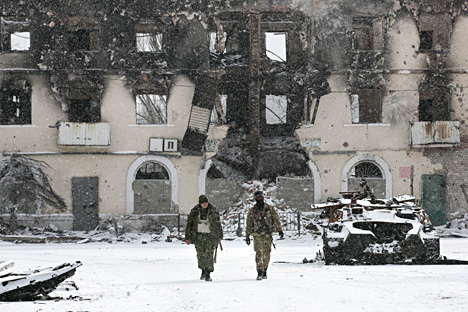 Observers are divided on how the situation around the "Debaltsevo pocket" will affect the fate of the ceasefire. According to Sivkov, what is happening in the area of Debaltsevo was not specified in the Minsk agreement, and therefore anything could happen there. The Ukrainian troops will probably make attempts to break through, but eventually they will give up, he said. The existence of the pocket will not affect the withdrawal of heavy weapons from the contact line in other areas, Sivkov said. At the same time, Tsyganok believes that the factor of the encircled Ukrainian troops will "play a negative role in the implementation of the agreements in Minsk." According to him, the pocket may make it impossible for the rebels to withdraw heavy weapons. There are only two kilometers between the "pocket" and the contact line, from where the artillery and rocket launchers should be removed, Tsyganok pointed out. At the same time, according to Institute for Political and Military Analysis deputy director Alexander Khramchikhin, "it is still not clear who and how will control the removal of heavy weapons." "Even if it is removed, to return it to its original location is a matter of just a few hours," he said in comments to RIR.